EU defence ministers held their first meeting in the framework of PESCO, EU’s new Permanent structured cooperation aiming to strengthen military and security cooperation in Europe, but cooperation with NATO will go head so long. Brussels, 6 March 2018 - Middle East Diplomatic (MED) -EU defence ministers held their first meeting in the framework of PESCO, EU’s new Permanent structured cooperation aiming to strengthen military and security cooperation in Europe. The EU member countries which in the last months experesed in media that their feel threat from neigboring country Turkey, namely Cyprus, Greece and Bulgaria are also with PESCO, but cooperation with NATO will go head so long. The EU defence ministers also discussed future cooperation projects together with Federica Mogherini, High Representative for Foreign Affairs and Security Policy and Rose Gottemoeller, Deputy Secretary General of NATO. After the meeting, Federica Mogherini, High Representative for Foreign Affairs and Security Policy announced that “with the defence ministers, we had a historic first meeting of the Council in the framework of the permanent structured cooperation. We have a collective responsibility to implement the decisions taken and deliver on the commitments taken by the member states participating in PESCO”. 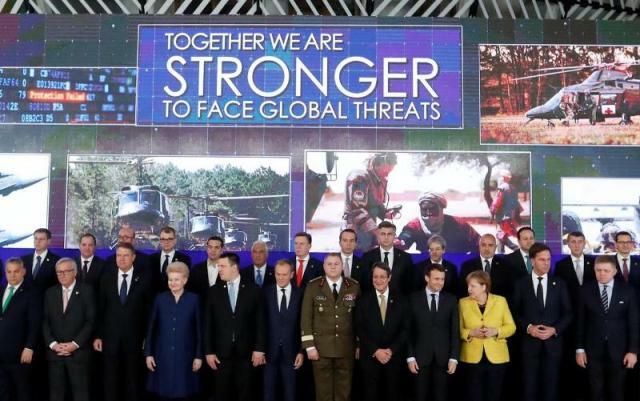 According Mogerini, The EU Ministers also pointed out that stronger European cooperation on defence makes for a more robust European pillar within NATO, and that this work is conducted in full complementarity with NATO. Noting that it will give new political impetus to cooperation between the two organisations, they welcomed the agreement of the President of the European Council, the President of the European Commission and the Secretary General of NATO to start working towards a new declaration which could be signed in the margins of the forthcoming NATO Summit in July.